This recipe is a family favorite. It’s a great side dish for so many entrees but we love to serve it with prime rib, ham and roast chicken. It was on our Christmas menu this year as a side to our prime rib. While the recipe requires multi-tasking and a watchful eye, the effort is worth the result! I prep the onions prior to starting anything and then prep the green beans while cooking the bacon. Don’t substitute anything for the cider vinegar. It makes a difference. Read through the recipe before beginning. This recipe is perfect for company too! It makes 12 servings but can easily be down-sized for a smaller group. Cook bacon until crisp in a large skillet. Remove bacon, drain and crumble, reserving 1 tablespoon drippings in the skillet. Add butter to drippings in skillet. Cook and stir over medium heat until melted. Add onions and garlic to skillet. Cover and cook over medium-low heat about 12 minutes or until onions are tender, stirring occasionally. Uncover, add vinegar and brown sugar. Cook and stir over medium-high heat about 4 minutes or until onions are golden. Meanwhile, cook green beans in a large saucepan in a small amount of lightly slated water about 10 minutes or just until crisp-tender. Drain. 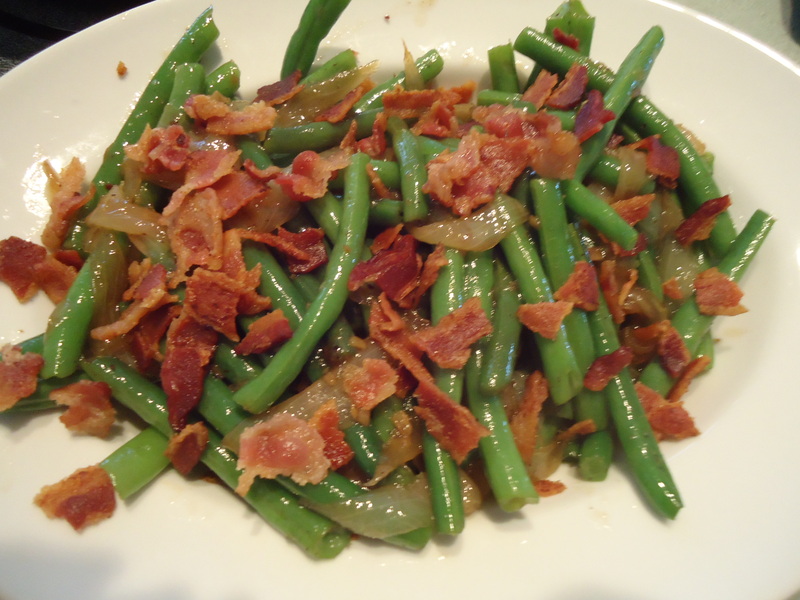 To serve, toss green beans and onion mixture together. Transfer mixture to a serving bowl. Sprinkle with crumbled bacon. This entry was posted in Christmas, Company Worthy, Easter, Entertaining, Holidays, Side Dishes, Sunday Dinner, Thanksgiving and tagged Bacon, green beans, green beans and bacon, onions, side dish. Bookmark the permalink.